Neria Biala became a peace activist when, at the urging of a friend, she attended a West Bank demonstration at Sheikh Jarrah in East Jerusalem. The demonstration was a protest against the evictions of Palestinians from their homes, a process that has been going on for more than 60 years, and which many peace and human rights activists around the globe consider to be a blatant form of ethnic cleansing. In any case, Biala was shocked by what she saw there: "What struck me the most was the violence; the army and the police were extremely violent." Biala then embarked on a journey of re-education. Now, with a new understanding of the conflict between the Israelis and Palestinians, she sees Sheikh Jarrah as a microcosm of the Jewish state's ills. 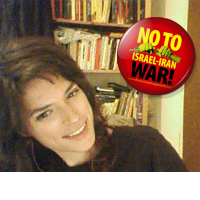 She also sees participating in such protests as a step towards safeguarding Israeli democracy. Biala believes that Israelis who are uninformed and uninvolved are harming their country and endangering themselves, saying: "It's suicide not to know what's really going on here." Neria Biala signed the letter below. It is the response of the Sheikh Jarrah activists to the Elie Wiesel letter on Jerusalem. She was joined by some of Jerusalem's and Israel/Palestines's most prominent intellectuals, including philosopher Avishai Margalit and Jewish studies scholar Moshe Halbetal. The letter was also signed by Avraham "Avrum" Burg, a former chairman of the Jewish Agency and World Zionist Organization, and a former Speaker of the Knesset. Burg also served as interim President of Israel for twenty days, after the retirement of Ezer Weizman. But Burg does not think it is in Israel's best interests to deny equality and basic human rights to Palestinians. In 2003 he lobbied for Israel to withdraw its occupying forces from the West Bank, and on the subject of "terrorism" he said: "Israel, having ceased to care about the children of the Palestinians, should not be surprised when they come washed in hatred and blow themselves up in the centers of Israeli escapism." To illustrate how dangerous it is to be a peace activist in Israel/Palestine these days, Burg was wounded by a grenade while taking part in the Peace Now demonstration in Jerusalem in February 1993. Another peace activist, Emil Grunzweig, was killed in that demonstration. Our Jerusalem is concrete, its hills covered with limestone houses and pine trees; its streets lined with synagogues, mosques and churches. Your Jerusalem is an ideal, an object of prayers and a bearer of the collective memory of a people whose members actually bear many individual memories. Our Jerusalem is populated with people, young and old, women and men, who wish their city to be a symbol of dignity—not of hubris, inequality and discrimination. You speak of the celestial Jerusalem; we live in the earthly one. Indeed, your claim that Jerusalem is above politics is doubly outrageous. First, because contemporary Jerusalem was created by a political decision and politics alone keeps it formally unified. The tortuous municipal boundaries of today's Jerusalem were drawn by Israeli generals and politicians shortly after the 1967 war. Feigning to unify an ancient city, they created an unwieldy behemoth, encircling dozens of Palestinian villages which were never part of Jerusalem. Stretching from the outskirts of Ramallah in the north to the edge of Bethlehem in the south, the Jerusalem the Israeli government foolishly concocted is larger than Paris. Its historical core, the nexus of memories and religious significance often called "the Holy Basin", comprises a mere one percent of its area. Now they call this artificial fabrication "Jerusalem" in order to obviate any approaching chance for peace. We invite you to our city to view with your own eyes the catastrophic effects of the frenzy of construction. You will witness that, contrary to some media reports, Arabs are not allowed to build their homes anywhere in Jerusalem. You can discover and see gross inequality in the allocation of municipal resources and services between east and west. We will take you to Sheikh Jarrah, where Palestinian families are being evicted from their homes to make room for a new Jewish neighborhood, and to Silwan, where dozens of houses face demolition because of the Jerusalem Municipality's refusal to issue building permits to Palestinians. We, the people of Jerusalem, can no longer be sacrificed for the fantasies of those who love our city from afar. Our this-worldly Jerusalem must be shared by the people of the two nations residing in it. Only a shared city will live up to the prophet's vision: "Zion shall be redeemed with justice". As we chant weekly in our vigils in Sheikh Jarrah: "Nothing can be holy in an occupied city!"